Ironic that this photograph should have appeared 35 years ago in Die Burger of 13 November 1981. My thoughts are with you and your family at this sad news. I have been away and just got back to the very sad news of your sister Ingridâs passing. I am very sorry to hear that and wish to send my sincerest condolences to all the family. 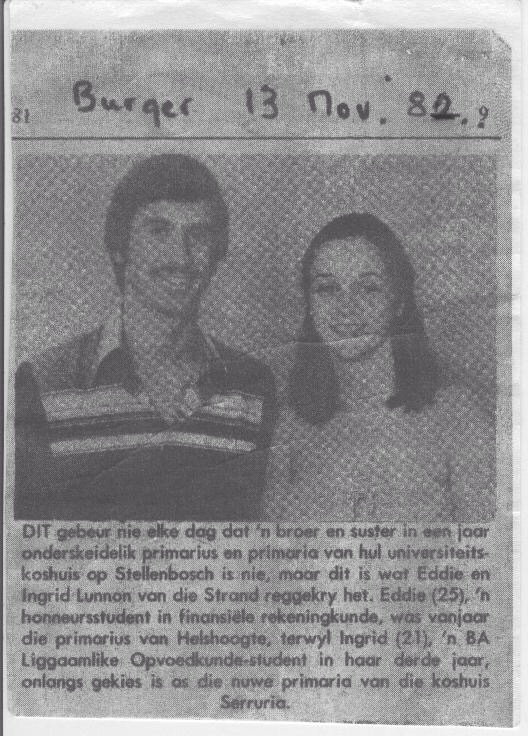 The picture you posted of you 2 in Die Burger is my lasting memory of her as I never saw her again after university. May she rest in peace and you all be comforted by the Holy Spirit.